Hotel Taj Resorts, Agra's modern 3 star hotel located in the very heart of town, at level with Taj elegant Mall and very close to Tourism Lift. The hotel is one of the premium hotels in Agra near Taj Mahal, successfully combines Today's amenities, services and comforts with the graceful ways of life that belongs to an older era. 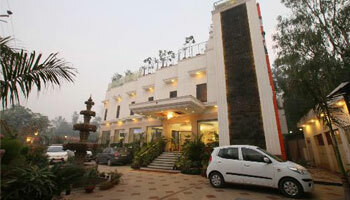 Hotel Taj Resorts is an intimate, boutique hotel in Agra provides dramatic views of Agra Culture. Enjoy our luxurious accommodation services with complimentary facilities like fitness centre, business centre and an restaurant offering panoramic views of the harbour and the skyline. Room Service, Laundry Facilities, Breakfast Services, Security Guard, Backup Generator, Currency Exchange, Airport Transportation, Travel Counter, Parking, Doctor on Call. Cable/Satellite TV, H/C Water, Toothbrush/Razor on Request, Attached Bathroom, Air Conditioning Room, DVD Player, Iron/Ironing Board, House Keeping, Wakeup Calls.